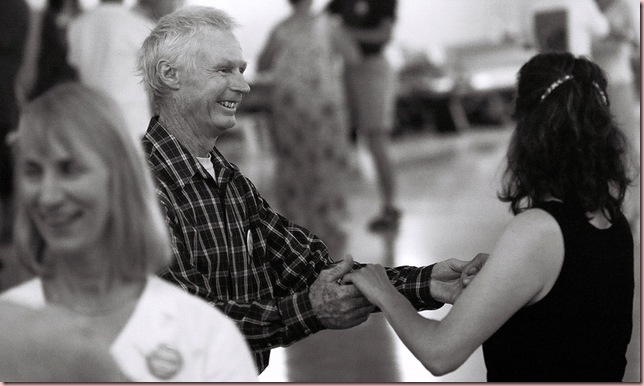 Richard Wilson, longtime dancer, dance caller and folk community icon, passed away peacefully today, August 4, 2011, at home surrounded by his family, wife Karolyn and daughters Emily, Karina, Lily, Laurel and Charline. Although he fought his melanoma cancer with all of his being, biology triumphed and death prevailed, as it will for each of us. Each year the anniversary of our own death passes us by with nary a blip or acknowledgement, mostly because we don’t know that day yet. Cherish life, dance often, support traditional music and dance, honor Richard’s memory by loving well and living with joy. I first met Richard and Karolyn Wilson around the fall of 1984 at the Heights Community Center in Albuquerque, New Mexico. Emily was already born (and probably snugged to Richard’s chest while he danced). Karolyn was pregnant with Karina and dancing away. Both Richard and Karolyn glowed while dancing together. Soon after, Richard stepped up to fill a caller void when Pam McKeever left for New York. We were a small group. I think Mimi Stewart and Richard were the main callers back then. Then Richard took a job in California for awhile, and the family moved with him. New Mexico called him and his family back several years later. They’ve lived here ever since. One vivid memory I have of Richard is from 1991. I was a new caller, terrified of being on stage. So I practiced and practiced and practiced to overcome my fear. I called one dance (out of an evening of dances) in Albuquerque and one dance (out of an evening of dances) in Santa Fe. The Albuquerque caller coordinator then decided I was ready to call my first whole dance—on December 7, 1991 (the 50th anniversary of Pearl Harbor Day). I saw Richard at a dance before my gig and reported that I was about to take the plunge. After hearing the date of my first whole dance, he said, with a gleam in his eye, “Well, then, it’s OK if you bomb!” We laughed and laughed, although 19 years later, he claimed to have no memory of this exchange. Richard believed steadfastly in giving everyone access to the folk community, be it dancers, callers or musicians. No matter what the skill level of callers and dancers, he encouraged them to learn and have fun. Richard was the first caller I ever saw fly off the stage and into the dance line, calling and dancing simultaneously. Eventually, I too learned this instant access to rhythm and community. He and I have different calling styles, but we enjoyed egging each other on. He provided an entertaining evening for all in attendance. Once, in the early 1990’s, a new and unskilled caller stood on stage for 45 minutes trying to teach a difficult dance that he did not understand. After the music started, the dance broke down and people were gathering their bags and leaving the dance hall in frustration. Richard leaped onto the stage from the dance floor, took the microphone, yelled, “Line up for a contra, no walk-through! !” and proceeded to gather everyone back into dance mode. He saved the evening. This was the only time I ever saw him assert control over a floundering individual for the good of the group. Otherwise, he reminded everyone to be kind and patient, go with the flow, and not dwell on our mistakes. That is exactly how Richard danced and taught dance. He treated each partner as a queen. He took care of her, made her shine, guided her gently and grinned (even if the “she” was a guy dancing the woman’s part!). Then he moved on to the next partner with the same focus and flair. When teaching dance he wanted us to take care of each other. He wanted us to look beautiful. He wanted us to flow gracefully and to create synergy from music and dance. That was Richard’s goal: for us all to embrace the elegance that the marriage of music and dance evokes, to bask in the beauty of the moment. He wanted us to have fun. He was the “pied piper” of dance leadership, often instigating long swirling, weaving, crisscrossing lines of dancers just to get people on their feet. He was a master of the grand march, directing dancer traffic into two lines of individuals, who reunited as couples, then two couples merged into a line of four, then four couples merged into a line of eight, and so on. Everyone could participate successfully and light-heartedly, as Richard subtly led them all to move effortlessly and delightedly to the music. I’ve learned a lot from Richard, watching him teach dance, watching him share his love of dance, watching him build community whether it be a one-night-stand wedding gig or a regular dance, watching the twinkle in his eyes as he set things into motion. “Get ‘em up, get ‘em movin’” no matter age, experience, gender. Include everyone. My most poignant Richard story occurred at New Mexico’s annual Folkmadness Music and Dance weekend in Socorro, New Mexico in 2005. Richard was supposed to teach an early Sunday morning English country dance workshop there. But he was in the middle of treatment for his cancer and was unable to do so. At the last minute, I was asked to teach the workshop instead. To understand this story one must understand that, for almost 25 years, I disparaged English country dance. I heard birds tweeting in every tune, all of which I thought were silly. I lacked the grace and carriage to dance English well. I lacked the wisdom to understand the dance. I didn’t know it at the time, but I disgraced dance leadership. Meanwhile, Richard loved English country dance exactly as much as I disliked it. He was the grand master of English country dance in his baby blue silk jacket with his elegance and poise, setting and turning and arming and heying with a proper English attitude. He had danced and called English country dance for years and years. He was the obvious choice to lead this workshop, not me. Richard wasn’t a heavy-handed or judgmental leader. He was gentle. He let you make mistakes, he didn’t lecture. Maybe he believed you’d figure it out eventually on your own. I did. In April 2004 I abruptly corrected the error of my viewpoint. I was in Nashville, TN staying with Susan Kevra and Russ Barenberg. Susan took me (apologetically, knowing my lack of enthusiasm) to a small English dance in a hot gymnasium with recorded music. She taught Jaque Latin, and I danced it with about 20 others. At the end I said to her, “That was fun!” She looked at me in disbelief, and I clapped my hand over my mouth in shock. I was suddenly inexplicably smitten by the joy, verve, grace, and fun of English country dance. I started my English dance collection that weekend, poring over Susan’s dance collection with her humming tunes to me. I share these details so that readers appreciate the supreme irony of me substituting for Richard Wilson in leading an English country dance workshop only a year after my conversion. So it was May 2005 at Folkmadness, and I was emergency-subbing for Richard. I was working with a band called The Cantrells (Emily and Al, more serendipity, from Nashville, TN) who used to play English tunes 20 years ago. We weren’t at all sure about our workshop, so we had a band practice, complete with dancers, under the spreading sycamore tree the day before. The Cantrells brushed up on their English tunes rather quickly; they were great musicians. I figured the workshop was early Sunday morning; usually only 20 or 30 people showed up. More than 100 people attended my workshop, including Nils Fredland, one of our guest callers for the weekend. And it was the first time I’d ever taught English country dance. I started with Well Hall, not the best choice for a beginner’s workshop. But I had come to love that tune and dance, the many “moments” of discovery and interaction throughout the dance sequence. The music started and I was observing from the stage many flailing contra dancers trying to master a new dance style. It looked AWFUL until unexpectedly, an amazing thing happened: the music took the dancers to where they needed to be. They settled down, started floating above the floor and leading with their hearts, maximizing the moments. The transformation was beautiful to behold. This was the only time in 20 years that I have cried on stage. The dancers (many of whom were startled to see me teaching English) were touched that I was touched. We carried on, not flawlessly, but exuberantly, playfully, and truly in the spirit of English dance. And certainly in honor of Richard Wilson, whose name I invoked more than once. Richard and Karolyn showed up later for lunch, and Richard sought me out to ask how my workshop went. I cried again, relating the details to him, and he seemed bemused by my emotion. I partly credit Richard for this lesson, which took me so many years to learn. He had been quietly leading English dance for years. I think he taught me, just by his example and without me even knowing it, how to be a better dance leader. Perhaps the greatest gifts that Richard and Karolyn have given to the folk community are their five daughters, Emily, Karina, Lily, Laurel and Charline. Watching Richard dance with each of his daughters through the years is a treasured memory. I suppose those girls had no choice but to grow up lovely, graceful, accomplished in music and/or dance. Karolyn is the matriarch of the family, raising five girls with love, warmth, strength, dance and song. And she has brought many other young lives safely into the world through her midwife practice. Emily has been a skilled dancer since age five. When less skilled, much older men would try to guide her incorrectly in a dance, she would politely but firmly decline the lead and go exactly where she should be. Eventually, the men came to rely on her to get them where they should be. Karina, also a graceful dancer, has evolved into a fiddler of extraordinary talent, the notes of English dance tunes hanging mid-air at the moment the dancers’ eyes meet or bodies swoop past. Her contra rhythms excel too. She started as all musicians must start, learning and goofing up as she went, visibly flustered when she made a mistake, forgot an A or B part of the tune, or dropped a phrase. Somewhere along the way, her tunes steadied, her repertoires increased, and she became an accomplished English country and contra dance fiddler. A bunch of us travelled to Oklahoma City in February 2008 for an English country dance weekend with Bare Necessities. Richard drove with two of his daughters and several other young dancers. He enjoyed dancing all weekend. My friends Meg, Kit, Mary and I joined the band for lunch on Saturday, and we told Mary Lea about Karina, who was attending as a dancer. Bare Necessities’ fiddler Earl had a high fever and struggled to keep up his energy. On Saturday night, we were waltzing to the achingly haunting notes of one of those “waltzes to die for.” I looked toward the stage and saw Karina sitting in with Mary, Jackie and Peter. I was stunned and thrilled! Earl was lying on his stomach behind the stage with acupuncture needles protruding from his neck. Karina, then age 23 and playing with some of the most talented musicians in the world, blossomed that night. Richard was there on the dance floor, in his blue silk jacket, applauding, proud papa beaming as he watched his daughter soar. Lily dances wonderfully too. Recently at a benefit dance for Richard and his family, Lily took the microphone and called one of her dad’s dances, flawlessly. I didn’t even know she was a caller. Laurel is 21 now, beautiful, poised, articulate, a dancer and singer. Her singing is the music of angels. She’s carrying on her maternal grandmother’s tradition of singing old folk songs to her guitar accompaniment. Richard devoted his time, energy, skill, and love to the music and dance community for more than thirty years, with enthusiasm and creativity. He and Karolyn have ensured that the folk traditions will thrive through their five charming daughters. Until the very end Richard continued to encourage our community’s youth and everyone else, to call, dance, play, flow, and have fun. 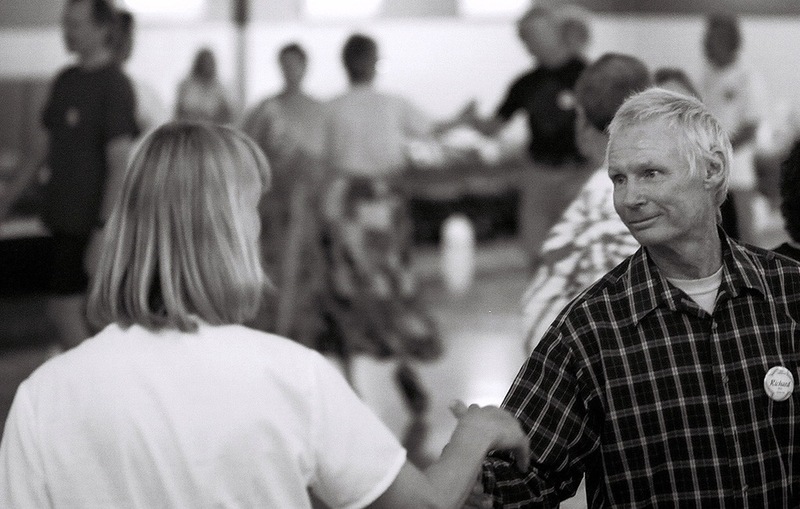 Even when he was too weak to dance, he continued to bask in the therapy of music and community. Thanks, Richard, for all you did for New Mexico’s traditional music and dance community. We are better dancers and leaders because of you. You will be missed for many, many years to come. May your spirit sprint across the universe and infuse us with joy and hope as we dance, play and sing in your memory. Also, check the www.Folkmads.org blog for updated information regarding visitation hours and family support. Posted: 08|4|11 at 1:29 pm. Filed under: Albuquerque. well done Merri, what a deserving tribute!! Thanks, Merri, for a lovely tribute. Thank you Merri for such a wonderful remembrance of Richard. I always enjoyed dancing to his calling, and also, dancing with him too. It is as you said so eloquently,…he always made you feel special. So sorry to hear of his passing. What a wonderful collection of stories. Thanks for sharing such poignant memories. Merri, this is very sad news. Indeed, Richard was the only one who ever talked me out from behind the cello to dance. I will always remember his quick smile and sparkly eyes, the huge passion he had for music and dance, and I always admired the love and pride he had for his beautiful family. We are the poorer for his passing. My heart goes out to his family and to his millions of friends who will miss him so much. Thank you, Merri, for the great tribute to Richard. Merri, this is a totally beautiful eulogy for Richard. Thank you for so beautifully capturing his spirit and his love of dance and his grace. My heart hurts with compassion for all of us as we learn of Richard’s passing and celebrate his being. Thank you dear Richard for your generosity and for your legacy. Thank you Merri. Very beautiful tribute, and photos. Very helpful, too, from this distance, to pull me back in and steep me in The Wilsons. Merri, that was such a beautiful and honoring tribute. I am sad to learn of his passing, but so glad to have known him and the wonderful Wilson family during my years in NM. Thanks for sharing. Merri, thank you for writing such a fine tribute to a man all of us in the dance community will miss. But we won’t miss him completely because he will live on in his choreography and his talented family. The community will cast off and wonder how they can fill the void now here…until one moment they will picture that grin and twinkling eyes Richard shared with us all. Wow, Merri! What a wonderful tribute! Richard’s family is certainly well equipped (by him) to carry on his loves & traditions. We will all miss him immensely. so beautifully said; a graceful, sparkling and joy-filled tribute, just like Richard, and yes, his whole family. Thanks Merri, and the portraits of those twinkling eyes on the dance floor, PRICELESS ! Thank you for sharing your love for Richard and your love for English Country dancing. Although I never met Richard, I feel as though I know him a little through your testimony, and am saddened that I never danced with him…on this earth:-). A poignant tribute to a good man and wonderful dancer and caller who gave so much to the folk community in New Mexico and elsewhere. We are grateful to have had the chance to play some tunes for him on the porch while rain dripped through the leaves a few weeks before he passed away. Even in his weakened state, his slippered feet padded out the beats to waltzes and hambos and he seemed dreamily transported back to the dance floor. I was hoping it wouldn’t be our last chance…. but his wonderful and musical family will carry on. Richard was a fine gentleman. What a neat example he was to others. We will miss him and remember the good times. We will never forget the twinkle in his eyes at every dance. Ahhh, Merri, thank you for writing so beautifully about the dancing joyful spirit of Richard and his wonderful family that continues to ignite our community with the Wilson music and compassion. What impressed me most was how he MC’d Tom Hunter’s wedding — the most beautiful reception I have ever seen, creating a real sense of community and belonging. Does anyone else have any good MC or wedding stories about him? Thank you Merri for this beautiful tribute. It transports me back to the many times when we got to work with Richard at community dances. I admire fully how he could get a chaotic group of youngsters dancing and having a great time even in a room with poor sound quality. He also always took care of the musicians, from taking care of the sound system to making sure they were fed.